One place China's Earth-bound and out-of-control spacelab, Tiangong-1, will probably not hit on Sunday is the forlorn spot in the southern Pacific Ocean where it was supposed to crash. 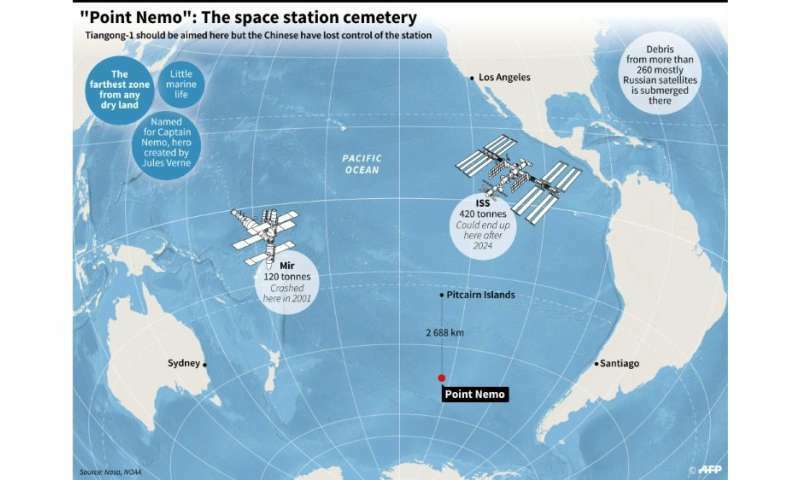 Officially called an "ocean point of inaccessibility," this watery graveyard for titanium fuel tanks and other high-tech space debris is better known to space junkies as Point Nemo, in honour of Jules Verne's fictional submarine captain. Point Nemo is further from land than any other dot on the globe: 2,688 kilometres (about 1,450 miles) from the Pitcairn Islands to the north, one of the Easter Islands to the northwest, and Maher Island—part of Antarctica—to the South. "Its most attractive feature for controlled re-entries is that nobody is living there," said Stijn Lemmens, a space debris expert at the European Space Agency in Darmstadt, Germany. "Coincidentally, it is also biologically not very diverse. So it gets used as a dumping ground—'space graveyard' would be a more polite term—mainly for cargo spacecraft," he told AFP. Some 250 to 300 spacecraft—which have mostly burned up as they carved a path through Earth's atmosphere—have been laid to rest there, he said. By far the largest object descending from the heavens to splash down at Point Nemo, in 2001, was Russia's MIR space lab, which weighed 120 tonnes. "It is routinely used nowadays by the (Russian) Progress capsules, which go back-and-forth to the International Space Station (ISS)," said Lemmens. The massive, 420-tonne ISS also has a rendezvous with destiny at Point Nemo, in 2024. In future, most spacecraft will be "designed for demise" with materials that melt at lower temperatures, making them far less likely to survive re-entry and hit Earth's surface. Both NASA and the ESA, for example, are switching from titanium to alumium in the manufacture of fuel tanks. China hoisted Tiangong-1, it's first manned space lab, into space in 2011. It was slated for a controlled re-entry but ground engineers lost control in March 2016 of the eight-tonne craft in March 2016, which is when it began its descent toward a fiery end. The chances of anyone getting hit by debris from Tiangong-1 are vanishingly small, less than one in 12 trillion, according to the ESA. "Nemo," by the way, means "no one" in Latin.